Chelsea coach Maurizio Sarri has admitted that it's going to be difficult to hold on to Belgian star Eden Hazard this summer. Hazard is a long-time Real Madrid target and has been strongly linked with a move to the Bernabeu this summer as he moves into the final year of his contract at Stamford Bridge. 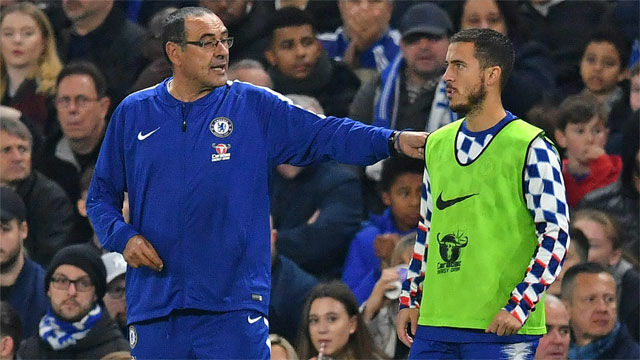 "To pay 100 million euros for him is really cheap," Sarri said after Hazard's brace in Monday's 2-0 win over West Ham in the Premier League. "In this market, that's very cheap. But if Eden wants a new experience, it will be really difficult to keep him." The coach added: "We have to accept his decision. At the moment, it's impossible to find another player at his level. We would have to find two players to do his job. I hope he stays given we'd have to do something special [if he leaves]. "I am sure the club don't want to sell. But, however, we all must respect his decision. If he wants another experience, we will accept it. Of course, though, we will try and convince him to stay."